Please fill out an online survey (Survey is closed) and tell us about your run. Further information about the reaches being studied is available through the project links in the box to the right. This run includes two sections. The upper 2.1 miles are described below (from Hwy 174 to Ben Taylor Rd). The lower nine miles are Class II (From Ben Taylor Rd to Combie Reservior). The Stanley Holbek book says the flows to run this at are between 300 and 600 cfs. Our day we had about 2.67 feet or so, which is about 600-650 cfs. I think the book is just outdated. In their defense they do say they only did it once and it was at the low flow. I know some people run it up in the high 1000s, however that is not for the normal boater and I am sure that it is class V at that level. As it were, I thought our flow was perfect. None of the rapids were pushy, the rocks were mostly covered, and eddies were still existent. This river although not that hard when being run successful should still be respected. The nature of the river is sieves. Shackleton related to me his experiences from seeing it at very low flows, and told of honeycombed river bottom, potholes six feet deep, and paddles that disappeared in the middle a rapid, never to be seen again. So, the rapids at my flow were class IV to IV+, but apparently both higher and lower are more difficult. So with all that said, I really enjoyed my day on the water. Don’t expect to spend a long day. If you know the lines, it will only take about 30 minutes to do the run. Even with the tree cutting, shuttle, photos, scouting, photos of the other group of boaters, watching them run rapids etc, it still only took 3 hours total… gas station meeting to parting at the freeway. This though is one of the nice things about the run, it is perfect to get on some great whitewater but not have to make a whole day of it. Well anyways, enough blabbering, I liked it and will be back… perhaps though in a few years if the trend for me and this river continues. One last thing, the only rapid names I know of on this run are “Trash Can” and “Spanky and the Gang.” The rest are generic… but those two are real, just thought all should know. Cacreeks guide to Bear river, class 2 section. Nevada Irrigation District controls the outflow from Rollins Reservoir and the diversion into Bear Canal. Ben Taylor Road is an access point that is used as a take out for the upper two miles of class 4 to 5. It is also used as a put in for the lower 9 miles of class 2 boating. 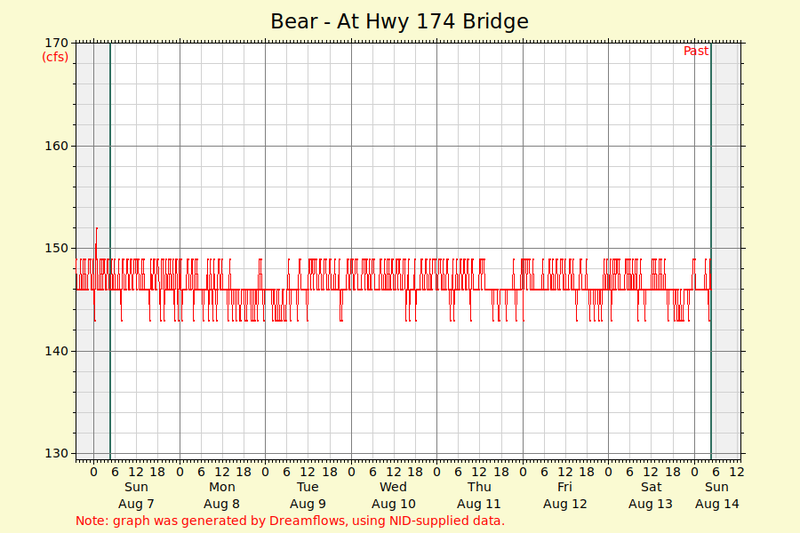 This flow information is being provided as part of the Yuba/ Bear whitewater flow study. American Whitewater in cooperation with Pacific Gas & Electric, Nevada Irrigation District, State and Federal Agencies will be collection information on the Middle Yuba, South Yuba and Bear watersheds over the next two years. Please fill out and online survey if you boat his reach. Bear River Basin schematic of diversions, reserviors and gauging stations as of 2006. USGS 11422500 BEAR R BL ROLLINS DAM NR COLFAX CA provides historical flow and other information about the gauge on this reach. USGS 11421900 ROLLINS PH NR COLFAX CA provides historical statistics and daily data for outflows from the powerhouse, but above the diversion canal. USGS 11422000 BEAR R CN NR COLFAX CA provides historical information on the amount of water diverted out through the Bear Canal. It is a bit hard, but here are the directions from Colfax. Take S. Canyon Way (follow signs towards historical Colfax). Turn left at Grass Valley St. (no choice, the road ends otherwise). After the historical part of town turn left on Rising Sun St. At the T, turn right on Ben Taylor Rd. Continue 0.7 miles to a fork in the road. Take the left road marked by “Pavement Ends” down the 1.4 miles further to the water. Put in: Going back to the town of Colfax, get on 174 and go north 3 miles out of town. Once you cross over the Bear River, turn right and park in the small lot next to the bridge. A trail starts under the bridge and leads down the 100 feet to the water. Nevada Irrigation District (NID) will be releasing 350 cfs into California's Bear River below Rollins Reservoir on Saturday, and Sunday, November 14 & 15. Releases will also happen from Wednesday to Sunday, November 18 to 22, 2009. A third release of 200 cfs will happen from November 25 to 29. NID, with the cooperation of AW, will conduct an “opportunistic flow study” to take advantage of these flows.